So you’re ready to start an ant colony. Congratulations! You’re in for a fantastic ride! The following are the most commonly asked questions of inquiring ant keeping enthusiasts. For more detailed information on these and all other ant keeping topics, be sure to check out the AntsCanada Ultimate Ant Keeping Handbook E-Book™. Also, be sure to check out our new Global Ant Nursery Project™ to find out if any of our official GAN Farmers are offering live ant colonies with a queen for sale in your area. What do I need? Do you have Starter Kits? Yes, we have starter kits that not only make things simpler and easier for you, but also help you save. Check out our great “All You Need” Starter Kit Gear Packs at our shop. We have two primary types of “All You Need” starter kits to choose from depending on what formicarium type you prefer. They contain all the necessary gear needed for every exciting stage of ant keeping, starting from when you first catch a queen ant to the time you have a mature, working ant colony. The ‘All You Need’ Hybrid Gear Pack includes, everything you need from test tubes to formicarium to outworld to all necessary accessories. The ‘All You Need’ Omni Gear Pack also contains everything you need for ant keeping. How do I start my Ant Colony? The best way to stock your ant colony is to farm your own colony from a single queen ant captured in your area during mating season. Capturing a newly mated queen ant is the first step, as she will be the seed that will perpetuate your colony for years. You can also attempt to collect an already mature wild colony but finding the queen can be difficult, and there is the possibility the whole colony might not be able to adapt to captivity well. In the world of ant keeping, farming your own colony from a single queen is the best method, and often times the most rewarding. Continue reading below for tips on catching a queen ant. I have a child that needs ants for his/her new ant farm? I am a teacher and my students need ants for their new ant farm. It is great to see parents and teachers supporting the child’s/children’s ant fascination. 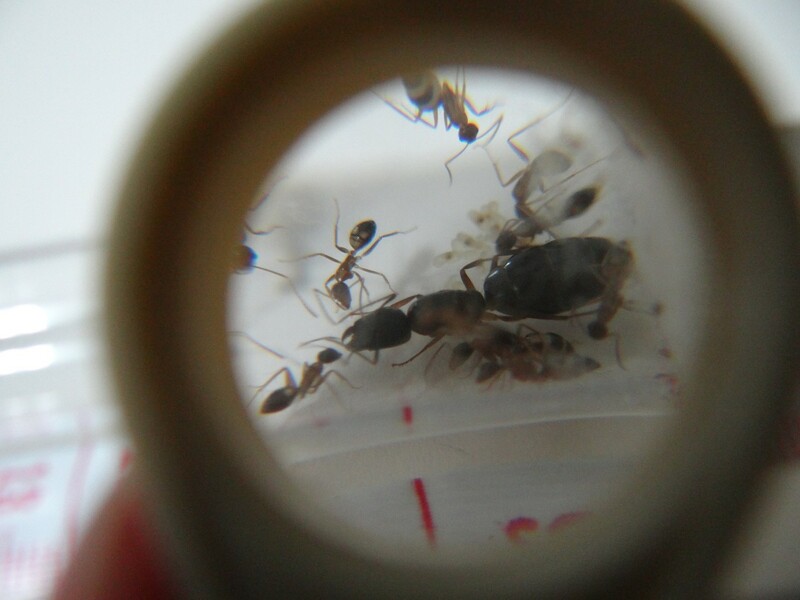 However, stocking an ant colony into a formicarium is a lengthy process, as the colony starts with just a queen, then in a couple months advances to just a small colony of a few workers, and then it takes about a year of focused care to get them to a mature colony of 100 or more ants. This usually may be more technical than a very young child or toddler to handle, not to mention an investment of a lot of time. Here are some questions worth answering: Are you or your child/students prepared for this kind of long-term, technical ant care or are you willing to help culture the ants from just a few workers to many workers? As mentioned, the process does take about a year or more. Do you have that amount of time? If not, perhaps digging up a wild colony might be the better route, as you can have many workers right away and should your child’s interest for the ant farm decrease, you can simply release the ants. These are just some things to think about. This young ant colony was raised from a single queen caught during nuptial flight and housed in a test tube setup. The species is Crematogaster cerasi. How/Where/When can I capture my own queen ant? How can I identify if an ant is a queen ant? Ants typically have specific periods of a few weeks within the year when mating occurs. These periods of breeding are called ‘Nuptial Flights’. All the ants you commonly see walking around above ground (the so called ‘ordinary worker ants’) are all barren females and do not mate during these Nuptial Flights or ever in their lives. The only ants involved in this mating event are young queen ants and male ants; they are known as alates, and are born in the nest and wait around all year until it’s time for nuptial flight mating. The alates are special in that they are born with wings. Yes, wings! 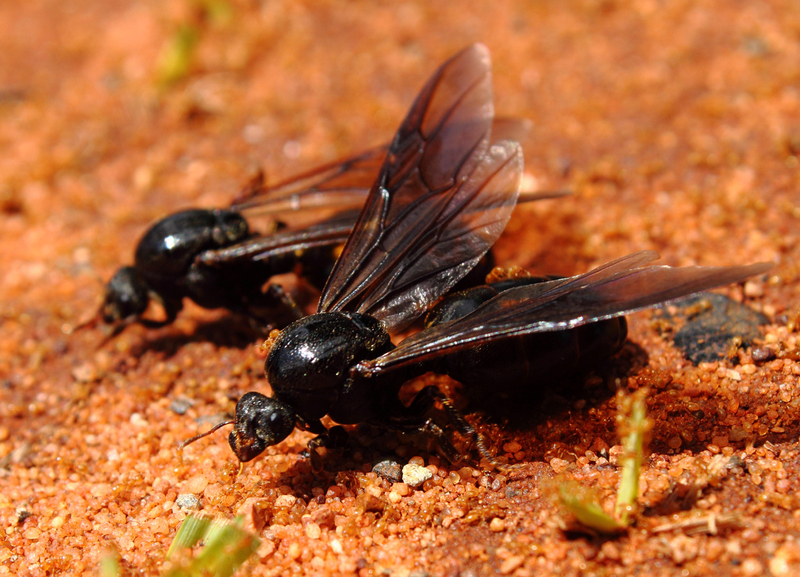 Have you ever seen those larger ants that look like ants with wings? They were ants after all, and not some kind of stiff hornet! Every species of ant has its nuptial flight around specific times in the year. During the nuptial flight the young winged queens and males fly into the air, they mate while flying or upon landing (the queen will often mate with several males), and then finally drop to the ground a few hours later. The males die after mating; breeding with the young queens during nuptial flight is their only purpose in the ant world. Mated females break off their wings and begin searching for a new location to begin their own colonies. Only a few species of ants will accept these now pregnant queens back to the nest, but generally most don’t, and the queens are off on their own in search of a suitable place to begin a nest, where each queen will eventually give birth to their first set of babies. Queen ants ready to mate for their nuptial flight. Species: Carebara sp from Africa. Your job is to try to find these queens that are either flying and mating during a nuptial flight or are in the midst of searching for a new nest location after their nuptial flight. These are the only opportunities for you to capture these newly gravid queens, because for the rest of their life afterwards they are underground. As for gravid queens that are wandering in search of a nest site after they’ve mated, you will be able to spot them by way of their larger size (so if you happen to see an ant scuttling about a few feet away that seems a little larger than usual, check her out!) and more importantly their two scars on their thorax where their wings used to be attached. Carry a number of small bottles or containers with you, everyday no matter what! Where ever you go have them in a pocket or bag. Keep your eyes to the ground as much as possible to spot the queens. Stick to sidewalks as they are open and perfect for highlighting moving insects. When you’re indoors anywhere, check window sills. You may find them at the huge windows trying to get out of stores or shops after having accidentally flown in. Try to be aware of all the insects around you. If something flies by, follow it with your eyes to see if it’s a queen (or even better a queen with a male or males mating with her) and try to see her better when she lands. If you’re good at picking up details, queen ants fly through the air more like lady beetles than they do flies, bees, or butterflies which are more agile and zig-zaggy fliers. After being more aware and informed on what to look for, you will find yourself running into queen ants more often than you ever thought possible. When you find them bottle them all up. Good luck! Be sure to check out the AntsCanada Ultimate Ant Keeping Handbook available at our store for tips and information on collecting your own ant queens and colonies. What if I don’t have the time to go queen ant hunting or am unable to find a queen ant anywhere? Another option, if capturing your own queen ant proves challenging, is to adopt an ant colony collected and farmed from a queen in your area from our Global Ant Nursery Project™ (if available in your area). The Global Ant Nursery Project™ is a worldwide network of AntsCanada-recruited expert ant farmers (known as GAN Farmers) who raise and sell local ant colonies with a queen to people within their city/region. Check out our Global Ant Nursery Project™ now by clicking here. What do I do with her when I capture her? What is the next step? You must place her into what is called a test tube setup where she can remain for a few weeks or months until her first set of workers arrive. Ant keepers usually house queen ants in test tubes because the test tube setup simulates a sort of underground chamber for a recently mated queen. It causes her to (hopefully) begin laying eggs to start her own colony. We highly recommend that you use AC-standard Test Tubes™ to get your queen ants started, as they are compatible with the variety of accessories that we offer at our shop that make this colony founding process easier for you. AC-standard Test Tubes™ come with our Hybrid Nests™ and our AC Gear Packs™ found at our shop. It is easy to create a test tube setup. The test tube setup involves the lower half of the test tube being plugged with a cotton ball to trap water on one end of the test tube (see Video Tutorials). This trapped water provides the queen with water during the several week period when she begins to lay her eggs and the weeks proceeding as her colony starts to grow. Ant keepers urge people to store these test tubes away in the dark and to not look at her or pick up the test tube, for you may disturb her, and some say disturbing them too much may cause the queens to not lay eggs or to even eat their eggs! If the queen immediately begins to clean herself and stops pacing around when you first place her into the test tube it usually means she feels like she’s found a safe, suitable place to station herself and start her colony. If the cotton in the test tube gets moldy or the water portion dries out, you will need to move the queen and her brood into a new test tube setup (see Video Tutorials). When is the nuptial flight of ants in _____ [city/state/province/country]? There are simply so many ants and so many nuptial flight schedules. Our Ultimate Ant Keeping Handbook Ebook contains all nuptial flight schedules of some of the more commonly kept ant species as well as ‘Ant Care Sheet Listing by Species’ section which list of the nuptial flight schedules of some of the more popularly kept species. I caught a queen and she hasn’t broken off her wings. Does that mean she hasn’t had a chance to mate and isn’t fertilized? No, that’s a common misconception. If queen ants don’t break their wings off it does not mean they haven’t mated with a male(s). On the same token, if a queen has broken off her wings it also doesn’t guarantee that your queen has mated. We have had queens with wings give birth to workers (but the wings were removed eventually), and had queens that did break off their wings never lay eggs, so wing breakage isn’t a good indicator of previous mating. So, be sure to keep all the queen ants that you catch even if they have their wings on, as they will likely be broken off later or once the queen’s first workers arrive. You will find out if your queen has mated during the nuptial flight once the first pupa hatches into an adult worker ant. If a male alate (with wings) comes out of the pupa you know she hasn’t mated and unfortunately won’t be of any use to you if you’re looking to start an ant colony. Unfertilized queens also tend to have brood that seem to never develop or scattered eggs within the test tube setup that they seem to not care for. So what are some signs that my queen has mated and is fertilized? The only sign that is a definite tell-tale sign is if her abdomen (also known as her gaster) looks big and bloated, a condition called physogastrism, and this usually happens several days or weeks after mating. The eggs tend to turn her gaster into a balloon. If she doesn’t balloon, don’t lose hope, as she still may be fertilized. On the day that you capture a queen, another sign that your queen may have mated is if she frequently begins to clean the tip of her gaster. If she’s giving that area some extra attention, you know a male may have been there previously. How long do I keep the queen in the test tube until I can transfer her into her formicarium? Ant keepers usually wait until she has several worker ants before transferring her into a formicarium. This ensures that she has a starting team of worker ants to help ease the process of moving the young and queen as well as the settling in process. We recommend waiting until she has at least 10-20 workers. Some prefer to wait until the test tube is completely full of ants before introducing them to a formicarium. During this period where the new queen raises her first set of young, do I need to feed her? Many say it’s not necessary to, as she has energy stored in her back muscles which powered her wings during the nuptial flight. However, you can choose to feed her a drop of sugar water every few weeks to fatten her up. Use a toothpick to create a small enough drop of honey she won’t be able to drown in. Some even choose to feed their queens crushed insects, however there is a chance the queen will get stressed when the food is introduced to her which can be counterproductive. A stressed queen may hold off from egg-laying or eat her existing brood. If you do provide your queen solid food, be sure to remove the leftovers asap, as it can cause a mold outbreak and even poison the queen/colony from the fumes emitted during decay. The only exception to all of this just mentioned is when you have a queen of a species that is semi-claustral, meaning the queen needs to feed during the founding stage. If you’re unsure whether your ant species is a semi-claustral species, contact us and send us a photo. Whether you have a queen of a fully-claustral or a semi-claustral species, what we also recommend is when a few workers start to appear, place the entire test tube into a larger container and the test tube can act as a temporary ant nest while your colony gets to 10-20 workers strong. You can place food in the container and the workers will venture out of their test tube to forage for food to eat. At this stage there is no need to provide them additional water because they can get water from their test tube. If you’re using one of our AC-standard Test Tubes™ to house your new ant colony, feeding can be made easier by using our Test tube Portal™ found in our AC Gear Packs™ at our shop. You can provide your new ants with a miniature feeding area. Another thing you can do is attach a second AC-standard Test Tube™ full of sugar water to feed the workers. One AC Test tube Portal™ can accommodate up to 4 AC-standard Test Tubes™. How do I move the colony to a new test tube if their test tube setup gets moldy? You will need to do this by connecting two test tubes together. If you’re using one of our AC-standard Test Tubes™ to house your new ant colony, transferring can be made easier by using our Test tube Portal™ found in our AC Gear Packs™ at our shop. 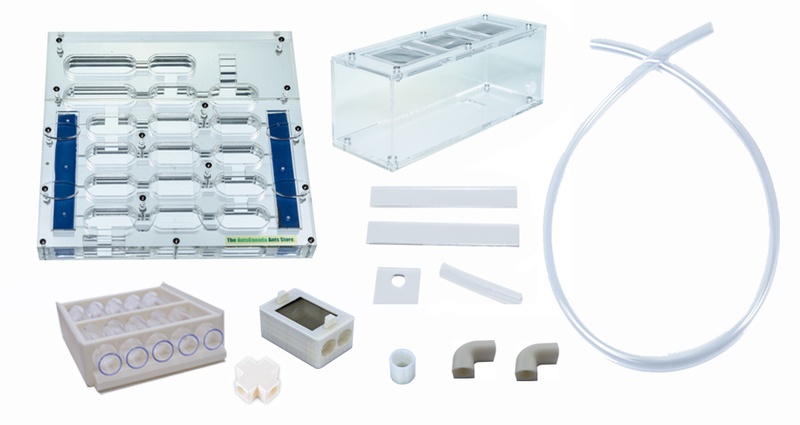 You simply connect the moldy test tube to the AC Test tube Portal™ then attach one or more clean test tube setups. The workers will eventually find the new clean test tubes and move on their own. We recommend that you allow the ants to transfer the brood and queen themselves, instead of using heat to force them out. As a general rule, most ant colonies will know when the mold will reach dangerous levels and will initiate the move to a clean test tube when it is the right time. One AC Test tube Portal™ can accommodate up to 4 AC-standard Test Tubes™. If you don’t have an AC Test tube Portal™ you can try to simply tape a clean test tube setup to your current moldy one and allow the colony to move on their own. Only in extreme cases when it is absolutely necessary to move the queen and ant colony in their moldy test tube setup, should you consider using heat to force a move. Also, don’t forget to allow air to enter the test tube every now and then if you are taping test tubes together. Remember that some ant colonies are stubborn and will remain in their test tube setup as long as they can. Patience is important at this stage. A little mold on the cotton of your test tube setup should not alarm you so much. When the mold grows to the point that you can no longer see white on the surface of the cotton in your test tube setup, that is when you know it is time to introduce the colony to a clean test tube setup. How do I move the colony from their test tube into their new formicarium? This process can happen immediately but it usually requires a few days, to weeks, to months. There are a few ways to do this. 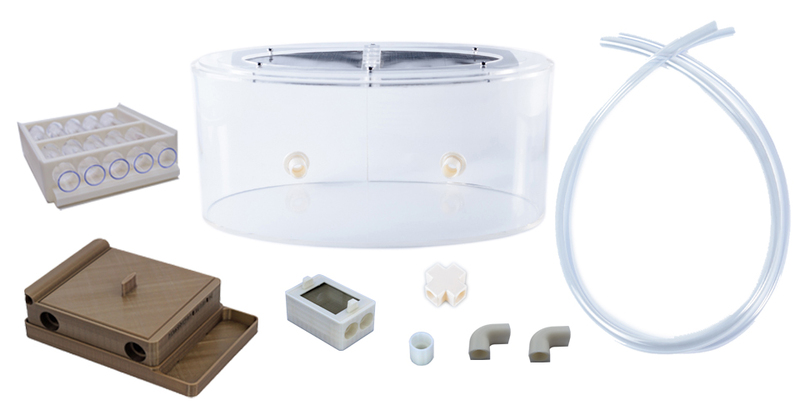 If you are using our AC-standard Test Tubes™ and are moving the colony into one of our Hybrid Nests™, you can simply attach the test tube with your ant colony directly to the formicarium. AC-standrard Test Tubes™ come with all of our Hybrid Nests™ and AC Gear Packs™ at our shop. 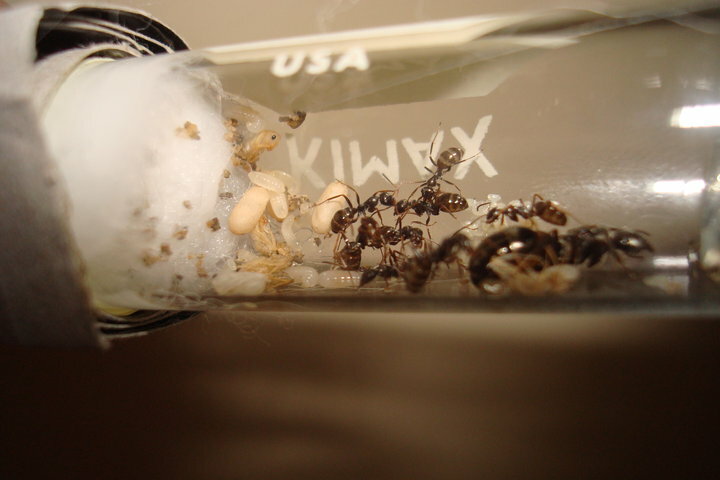 If not, another way to move ants from their test tube to the formicarium is to place the test tube directly into the outworld and lay the test tube opening close to the opening of the tube that leads to the formicarium. Shining a bright light into test tube from outside the formicarium and covering the nest area so that it is dark can help encourage the ants to move. If the species is a moisture-loving species you can attempt to moisten the nest area. Heating the test tube with a reptile heating cable also can encourage a move, but this can be a little dangerous for the ants if the test tube gets too hot too fast. Only a little amount of heat gradually applied is all that is needed to get them to move. 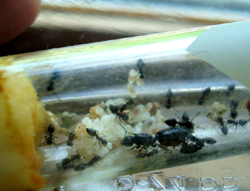 The moving process from test tube to formicarium often requires patience, but in time the ants move out. When they make the move into the formicarium, there will be no more ants or young in the test tube at which point you can remove the test tube and begin rewarding your colony with some food! How long does it take to farm a big ant colony from a single queen ant? It depends on the species of ant and factors like warmth and temperature. Ant colonies that are fed well and are kept a few degrees above room temperature develop faster. A quality home is also crucial for the growth rate of a colony. The queen ant’s first worker ants, known as ‘nanitics’, usually arrive a few weeks after a queen is captured and stored, and it takes several months to a year for the colony to have a good number of worker ants. Some ants like those belonging to Camponotus take two months to get from from egg to worker. Now that you know how to start your ant colony, feel free to read our helpful Ant Care section.